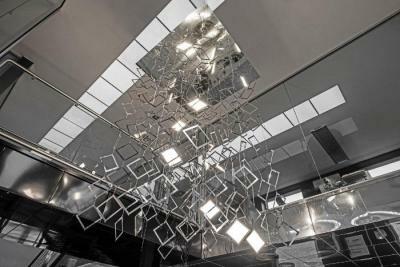 The Volker OLED luminaire, designed by Italy's Pugnale & Nyleve, is a large chandelier that has multiple wires dropping from a mirror (stainless steel) top square. 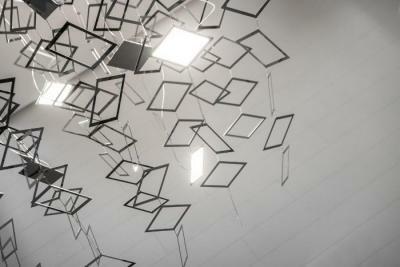 The Volker uses 16 Philips Lumiblade OLEDs (GL350, FL300 in the next edition). The Volker (designed by architect and designer Susan Evelyn Schmidt) is 1.7 m tall and 1 sq meter at the base. The design is inspired by the geometry of the square and the contrast between full and empty, and (despite its large size) it expresses grace and sense of movement. The Volker costs around €16,000 (just over $20,000).